Some of the most attractive modern keys to collect are automobile crest keys. These keys are usually gold plated or have a special finish such as jewelers bronze or nickel-silver. They may be enameled and have heavily embossed or intricately shaped key bows. A few of these high quality keys were once evem made from precious materials such as solid 14k gold or sterling silver, and encrusted with real diamonds, rubies, or amethyst (Figure 1). Often a crest key has on one side of the key bow a crest or logo of an automobile manufacturer while the other side of the bow is left blank so that the car ownerâ€™s monogram or initial could be attached in order to personolize the key. Thus, these keys are also sometimes called emblem, signet, or insignia keys. An exact definition for these marvelously designed and colorful keys is difficult. But, in general, any automobile key with a special logo, emblem, or monogram can be regarded as a crest key. When the first auto crest keys appeared is somewhat uncertain. Many of the keys made during the classic car period (1920-1936) were very decoratively designed and might qualify as crest keys. 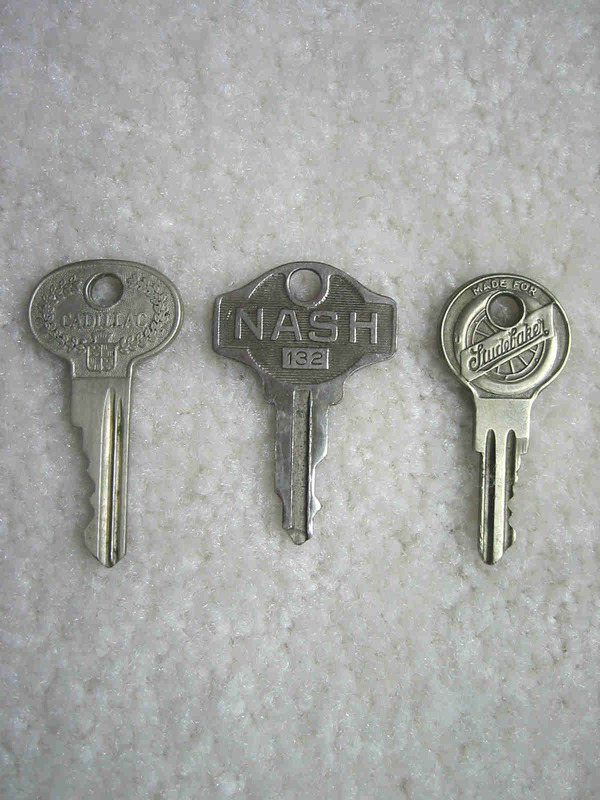 The early Nash, Studebaker, and Cadillac keys are some prime examples (Figure 2). In terms of a collecting category, however, many collectors would consider only auto keys that were manufactured with a more ornate design and finish then the standard stock keys provided with the car at the time of purchase as real crest keys. Usually crest keys were produced as after-market replacement items, but some crest keys were also made for promotional purposes and came with certain automobile models at the time of their release. By the late 1940â€™s there were numerous companies producing crest keys. Signa-Craft, Bar-Lyn, Carter, and Whitlock were some of the main manufacturers and suppliers during that time. Competition was heavy, and each company offered decorative and fanciful auto keys for all the major U.S. automobile brands. 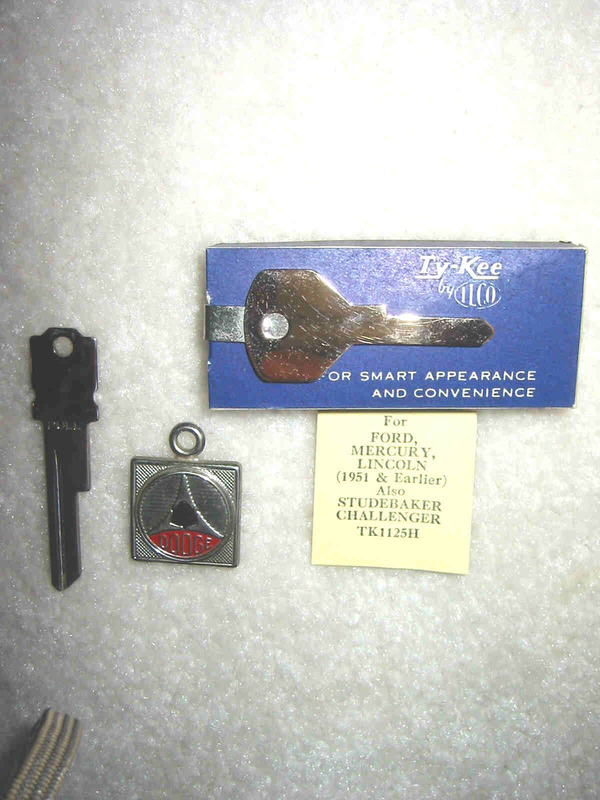 The heyday of crest key manufacture appears to have been between 1950 and 1975 when such major companies as National Key, Curtis, ILCO, and Taylor were providing distinctive crest keys for all domestic and even some foreign brand automobiles. 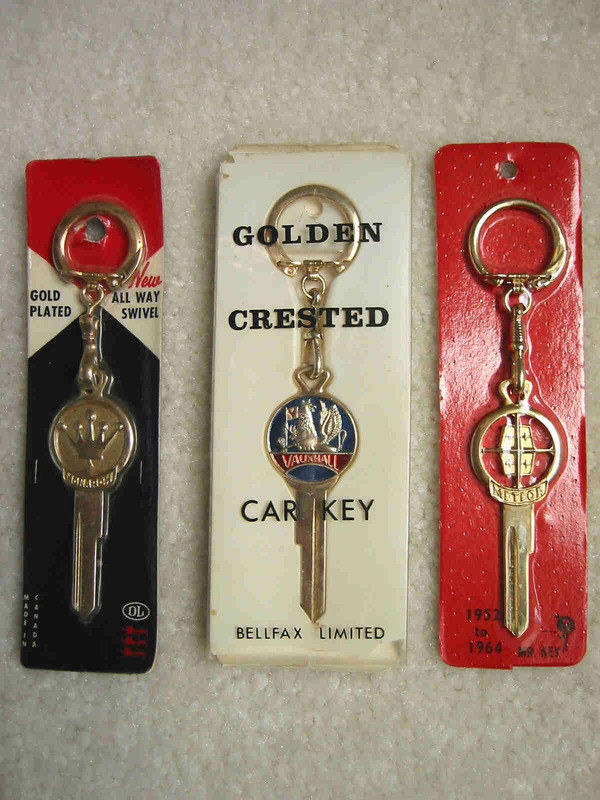 Crest keys became so popular that by the 1960â€s they were even available outside of the United States with companies such as Dominion Lock (Canada) and Bellfax Ltd. (Great Britain) also supplying the foreign market (Figure 3). 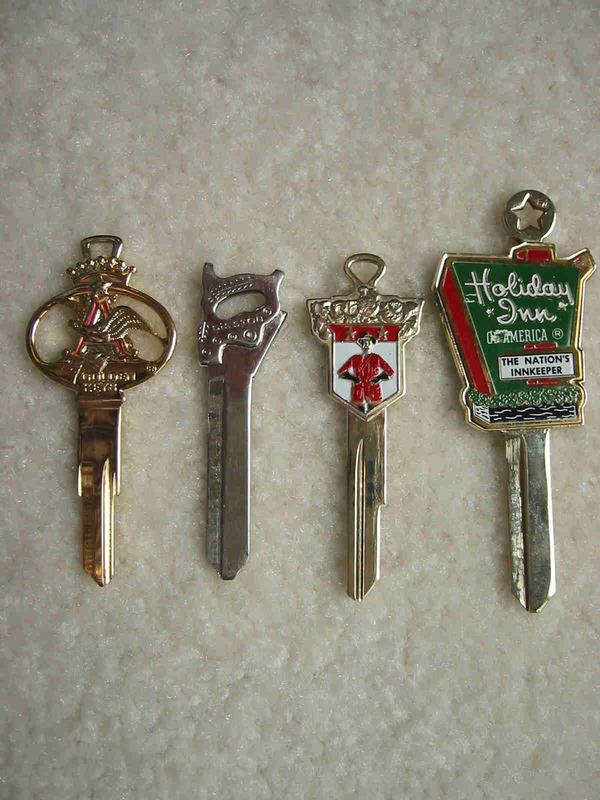 Crest keys were once widely promoted and were advertised in nationally syndicated magazines such as Life, Popular Mechanics, and the Saturday Evening Post. Due to the popularity of crest keys, the business community quickly realized that the keys could be made to convey almost any message to the consumer. Thus, â€œadvertisingâ€ crest keys appeared on the market. Usually these types of crest key blanks were made for a specific company or organization which then gave them away as a premium or gift to a good patron with the claim that they then could be easily cut to fit the customerâ€™s automobile. Nearly every type of industry and business used this method of advertising. This has provided the collector with both an interesting and abundant supply of key designs. Hundreds of examples of these types of crest keys can be found. Some crest were intricately embossed with unusual key head shapes while others were just simple generic round, square, or oval bowed keys to which could be attached a tag or tab picturing some distinctive company logo or advertisement (Figure 4). A few of the most attractive examples from the advertising crest key category are those promoting Anheuser Bush, Disston Saw, Drewery Beer, and Holiday Inn (Figure 5). 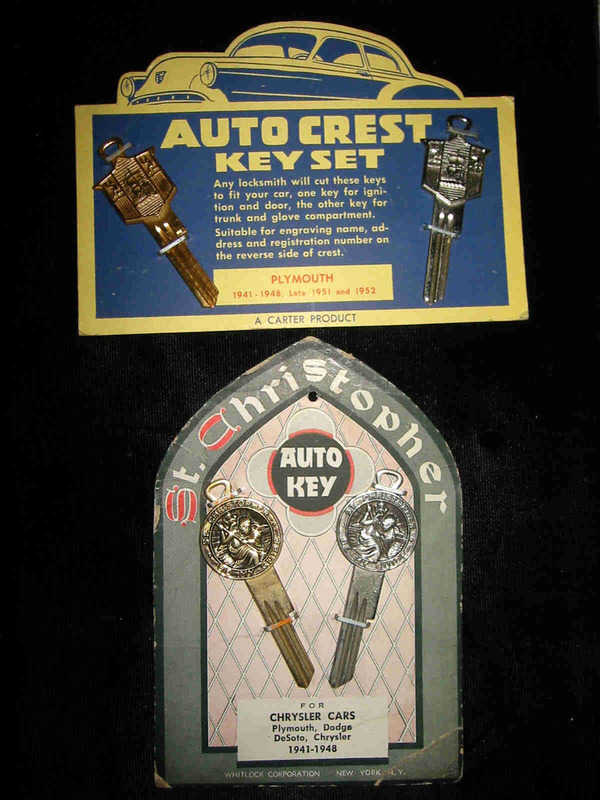 Crest keys were packaged and sold singly (usually to fit the ignition/door) or in sets of two with one key for the ignition/door and the other for the trunk/glove compartment. Some makers even offered attractive display cards for such sets (Figure 6). Presentation or gift sets were also made and came in special packages or boxes (Figure 7). Folding crest keys are a special variation of the crest key sets once produced. These unusual auto key sets usually featured a key for the ignition and trunk connected to a central body, which allowed each key to be folded-in when not used. They came in many different styles and were often attached to key chains. In addition to the folding crest keys, an interesting item was the folding key knife that consisted of a pocketknife containing one knife blade and one key blade (which could be replaced or inter-changed if needed). More desirable examples of these were marked with advertising from automobile dealerships (Figure 8). The most unusual auto crest keys that can be found are those that were made as novelty items. Most likely due to the heavy competition among key makers and the perceived popularity and demand for fancy and customized automobile keys by the public, unusual and gimmicky key designs were created. A very early example of this type of crest key (manufacturer unknown) featured movable hands, like that of a clock, on the bow of the key which were intended to be used for marking the expiration time for a parking meter. 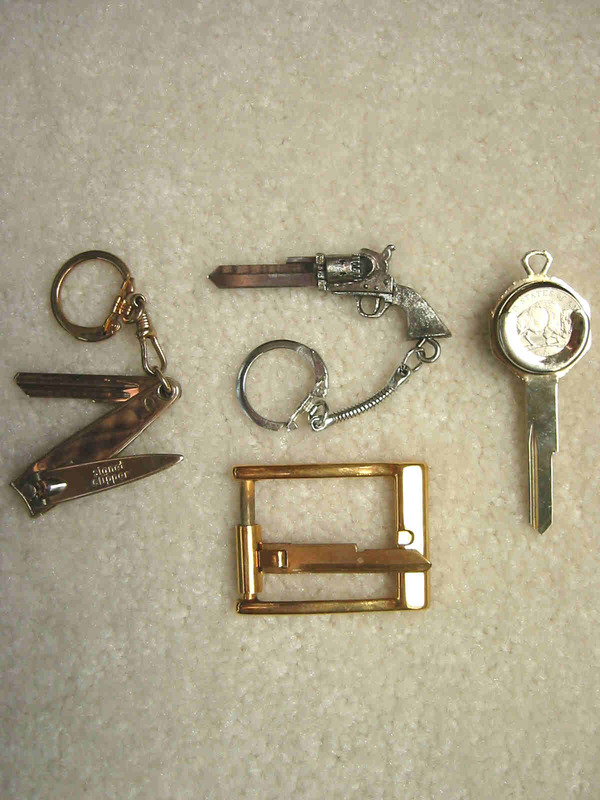 A unique set of gold plated auto keys were made in the 1960â€™s which had removable clear plastic windows on the key bow under which a photo of a loved one could be kept. 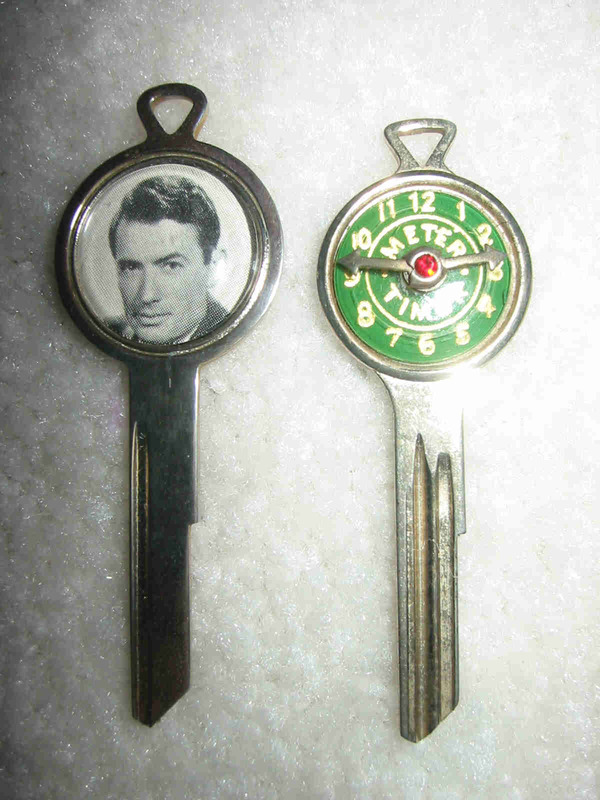 These keys were originally packaged with old time movie star pictures, just like the ones that were at one time often found inside the photo holder of a new wallet (Figure 9). Other original designs included crest keys that could be used as nail clippers, coin holders or were parts of belt buckles (Figure 10). Some were made to serve as tie clasps and others had removable bows (Figure 11). An especially clever key design, and also very difficult to find, is the Quick Draw 45 auto key made by Osco Corporation in 1968. The key is shaped like a Colt 45 revolver with the key blade serving as the gun barrel. These were made for all of the then current automobile makes, with a total of 18 different key blades available (Figure 10). Crest keys were also produced to mark special occasions, announce special events, or promote organizations. The earliest of these appears to be an automobile (Ford) key blank made for the 1939 San Francisco Exposition, and is pictured in Don Stewartâ€™s book, Antique Classic Marque Car Keys, published in 1993. There are also examples of crest key designs made to promote the 1960 Seattle Worldâ€™s Fair as well as the 1964 New York Worldâ€™s fair. Some additional interesting examples of crest key designs are those promoting the Idaho Territorial Centennial, and the Elkâ€™s club (Figure 12). Automobile crest keys continue to still be manufactured for the major automakers but only in very limited productions and are no longer available from the major key distributors as after market items. For example, during the years 1988-1996 Chrysler Corporation made available gold plated â€œCrystal keysâ€ for certain of itsâ€™ high end models. Ford had specially designed crest keys made for the re-introduced Mustang convertible in 1983 and for both the 30th and the 35th anniversary of the Thunderbird in 1985 and 1990. 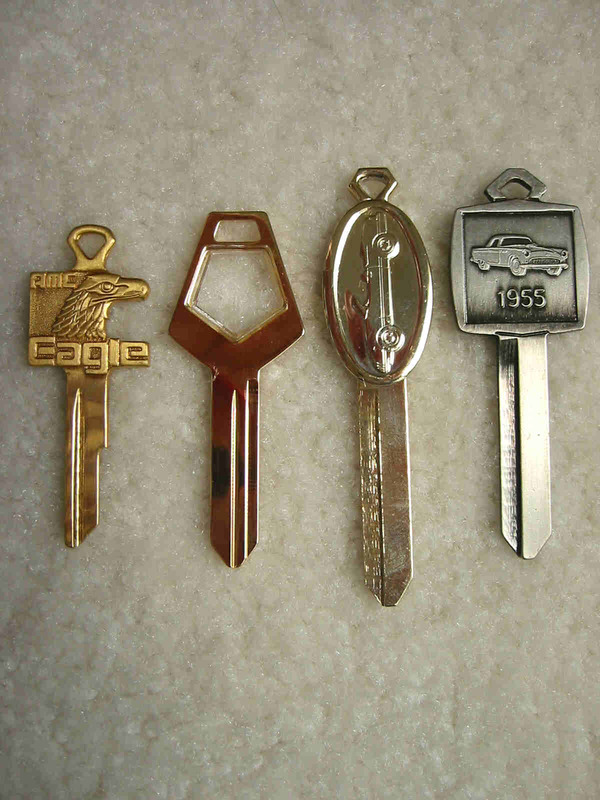 American Motors had a special gold key set produced for their AMC Eagle in 1980 (Figure 13) , and finally, GM had special keys made for Buick, Cadillac, and Oldsmobile (Figure 14). Most of my collection is available for viewing on the gallery section of the following website: www.gatreasures.com. I hope you will be able to visit and enjoy. Then maybe you too will catch the auto crest key collecting bug. Figure 1. 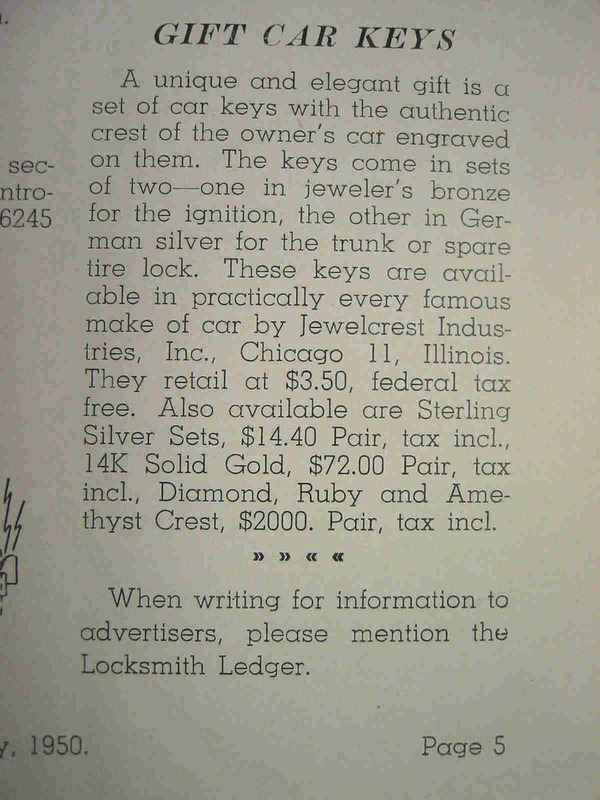 1950 Locksmith Ledger ad describing auto crest keys available in precious metals with gemstones. Figure 2. 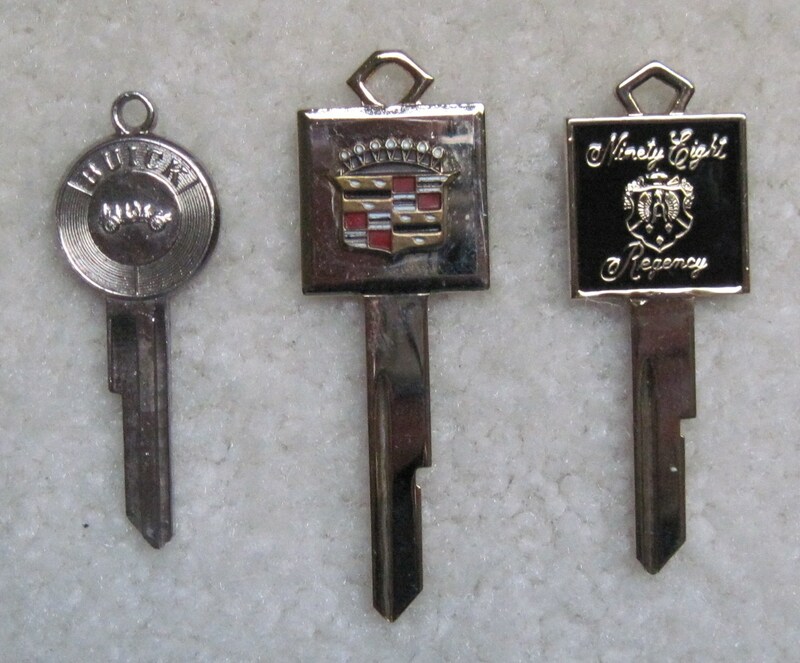 Early Cadillac, Nash, and Studebaker auto keys with embossed and decorative logo designs. Figure 3. Foreign auto crest keys: Left, Monarch crest key sold in Canada by Dominion Lock. Center, Vauxhall crest key sold in the U.K. by Bellfax Limited. Right, Meteor crest key sold in Canada by Mr. Key. Figure 4. 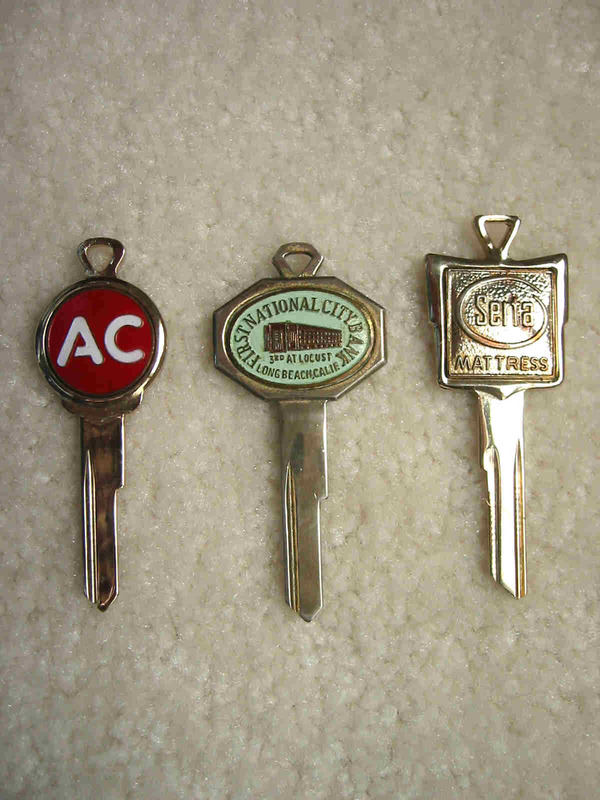 Advertising crest keys showing logo tags for AC spark plugs, First National City Bank of Long Beach California, and Serta Mattress. Figure 5. Heavily embossed and figural advertising crest keys for Anheuser Bush, Disston Saw, Drewery Beer, and Holiday Inn. Figure 6. Decorative sales cards for automobile crest keys. Figure 7. 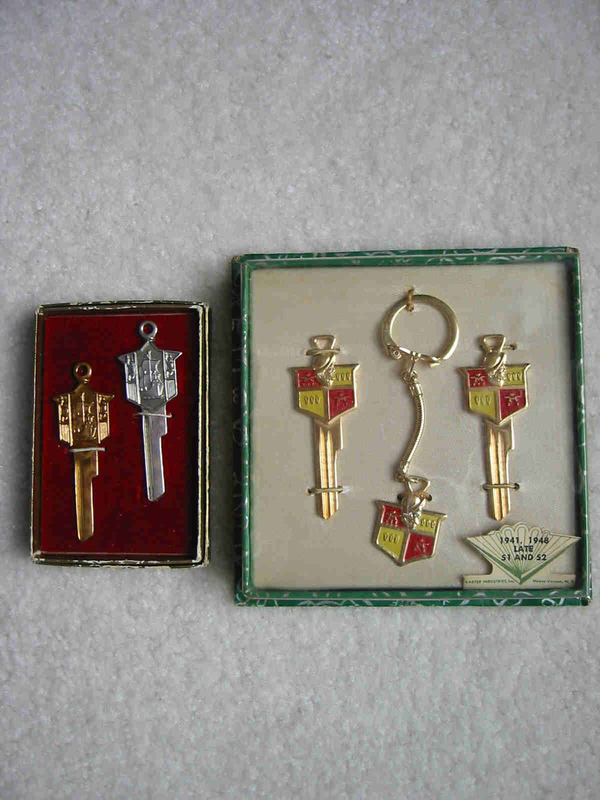 Left, presentation set of two Plymouth crest keys. Right, gift set with two Desoto crest keys and a separate logo crest key chain. Figure 8. Folding auto crest keys. Left top, Chrysler folding crest key blanks with enameled case. Left bottom, Studebaker folding crest keys with hard plastic case. Center, Pocket folding knife with a Chevrolet key blank. Right top, Oldsmobile folding key with hard plastic case. Right bottom, Willys crest keys in a round enameled case. Figure 9. Novelty auto keys, left, Ford key blank with movie star picture (removable) on the bow. Right, Chrysler key blank with bow allowing for marking parking meter time. Figure 10. 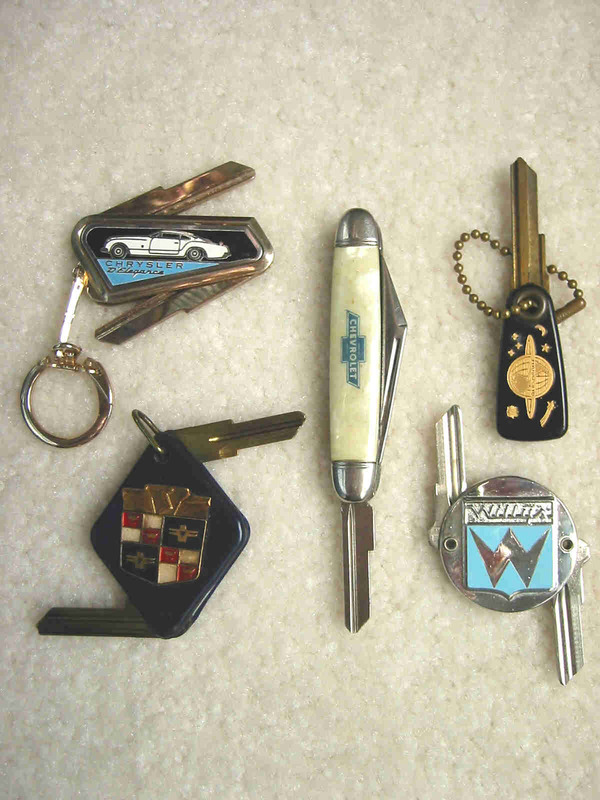 Novelty auto keys, left, pocket nail clipper with Chrysler key blank. Center top, Ford key blank shaped like Colt 45 revolver. Center bottom, GM key blank on a belt buckle. Right, Ford key blank with coin holder. Figure 11. Novelty auto keys, right, Dodge key with removable bow. Left, tie-clasp key blank for Ford and Studebaker automobiles. Figure 12. 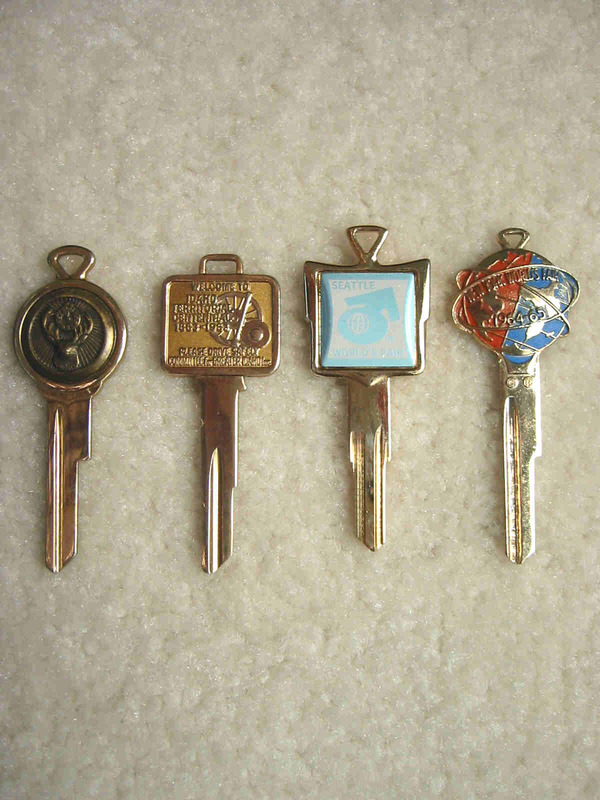 Promotional auto crest keys from left to right, Elks club, Idaho Territorial Centennial, 1960 Seattle Worlds Fair, and the 1964 New York Worlds Fair. Figure 13. Auto crest keys promoting the AMC Eagle, Chrysler, Ford Mustang convertible, Ford Thunderbird, GM Oldsmobile and Buck.